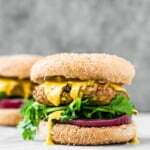 Paleo and gluten free turkey burger sliders on sweet potato buns. An easy bite sized recipe or appetizer! Did you know the official first day of summer was LAST week? I don’t know about you, but it has felt like summer here in Chicago for about a month now. I’ve been absolutely loving the heat, the longer days, and the chance to hang out on the patio with Tony. We also have a bird feeder, so Milly likes to come plop her belly out and watch the birds too. With the Fourth of July around the corner I have been SO excited to be using my ‘fridge and pantry summer staples in all of my recipes. A lot of people ask me what I consistently keep in refrigerator, and my super obvious answer is that it depends on the season! Right now I’ve been fully stocked with fresh seasonal fruits and veggies – berries, peaches (the best ever), zucchini, jalapeños (my personal fav), tomatoes, sweet potatoes, and the list goes on. I find myself really craving fruits & veggies for snacks during the summer months, too. Probably because of their higher water content (hello 90 degrees outside) and their refreshing tastes. The best snack? Veggies and hummus! 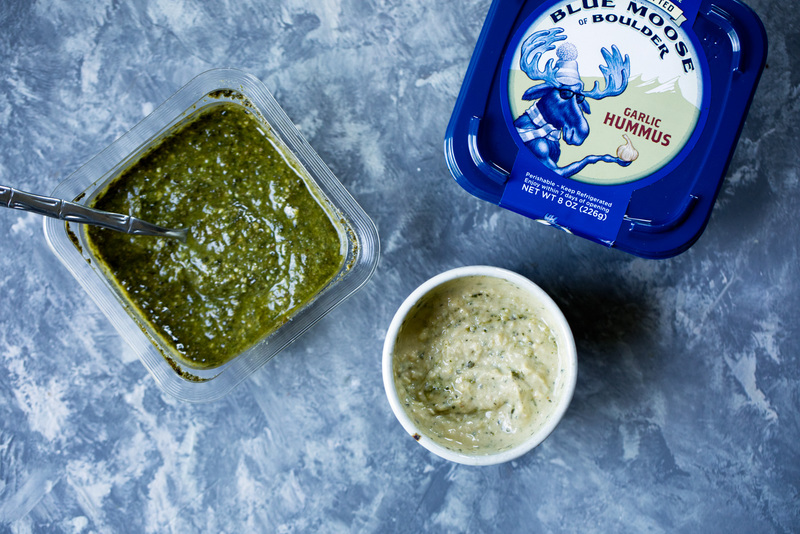 I recently tried Blue Moose of Boulder hummus varieties and their basil pesto — believe me when I say they are INSANELY GOOD. Let’s just say, I was super excited to be working on this with TheFeedFeed team. For hummus they have a bunch of different flavors: from roasted red pepper to lime and black bean, and my personal fav: green chile. They also have both a regular and nut-free basil pesto, and artisanal cheese dips…o.m.g. DELISH. The best part is that there’s zero preservatives or weird stuff you know exactly what you’re getting. I love simple ingredients. 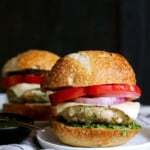 This brings me to my AMAZING Turkey Burger Sliders with Pesto Guacamole & Hummus Dipping Sauce! 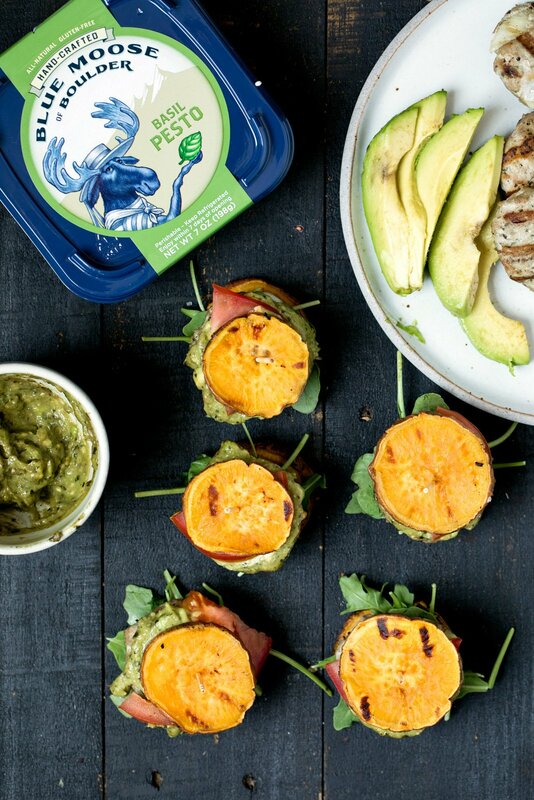 These mini burgers have Blue Moose basil pesto mixed right into them before grilling, so they’re super flavorful. I also mixed together a delicious pesto guacamole to pile on top with all the veggies, and placed these babies between two sweet potato rounds for a grain-free, vitamin-rich bun. Because I couldn’t help myself…I whipped up an incredible hummus dipping sauce using Blue Moose’s original flavor too. 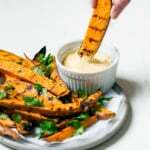 Check out http://bluemooseofboulder.com/ to stock up on their pesto and hummus for this recipe, and be sure to try out their salsas and cheese dips! Head http://thefeedfeed.com/ for more awesome summer recipes. 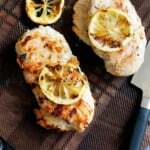 Grill these up and enjoy! Xo. This post is in partnership with FeedFeed and Blue Moose of Boulder. Thanks for supporting AK and the brands that help make this site possible. 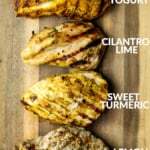 4 Easy Chicken Marinades + Living Lean & Clean with Just BARE Chicken videos! Weekend Favorites: Updates + a killer 32 minute workout for you! 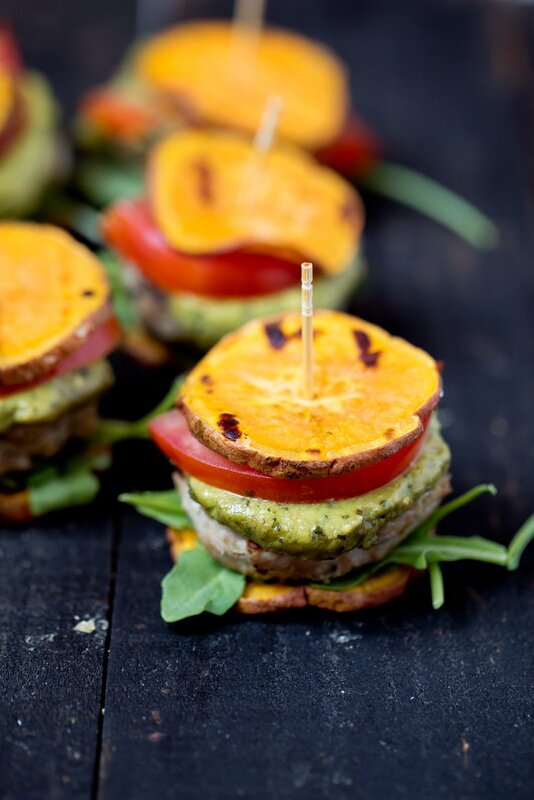 16 Responses to "Pesto Turkey Burger Sliders on Sweet Potato Buns"
Hey, this one looks really amazing. I have never in my whole life ate such an burger, can’t wait to try it! 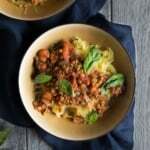 I love all of your recipes but was wondering if you have the nutrition content for this one as well? Hi Rose! I didn’t calculate nutrition for this one, but you could get a pretty good estimate with a nutrition calculator online using these ingredients! Outstanding burgers! 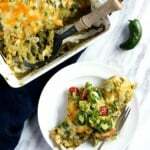 Even my husband and kids loved this and they are notoriously skeptical when I pull out a new recipe. Couldn’t find the Blue Moose Pesto so I made my own. Thank you for the wonderful recipes on this site. All have been outstanding!! Amazing!! So happy to hear that 🙂 Enjoy! Thank you for this! Was looking for a new recipe with turkey. Big hit. No guilt. Easy. Perfect! Glad you found this one! Have you tried substituting chicken for the turkey? I haven’t, but it should work well! I sent you an email a couple days ago about this. I’m an editor at Everyday Health and we’re doing a roundup of bun alternatives. 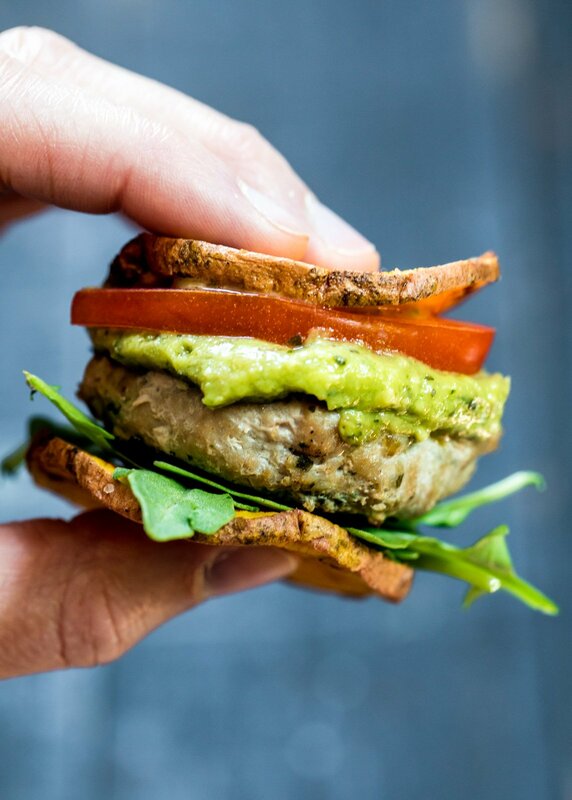 We’d love to use your sweet potato bun turkey burger recipe here! What we’d need from you is consent to use your pictures for the article. Let me know if that’s okay with you so we can publish the article as soon as possible! Any comment on my above comment? Let me know ASAP so we can get the article up 🙂 We would love to feature you on Everyday Health!